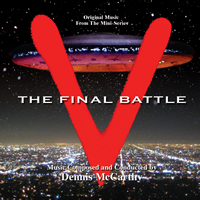 Dennis McCarthy's music from the 1984 NBC sci-fi mini-series "V"- THE FINAL BATTLE. "FINAL BATTLE" was a sequel to the hugely successful miniseries about the invasion of lizard-like aliens disguised to look like humans in order to gain the public trust. But in reality, their goal is to steal the Earth's water supply and harvest human beings for food. The mini-series starred Marc Singer, Faye Grant as the Earth resistance leaders and Jane Badler and Richard Herd as the evil reptilian invaders bent on world conquest. Dennis took over the FINAL BATTLE scoring chores from Barry De Vorzon around the middle of the production. He later returned to score the weekly series which debuted a year later. It was this music which helped bring Dennis to the attention of the producers of STAR TREK: THE NEXT GENERATION and from there, the rest was history. "V" THE FINAL BATTLE is digitally re-mastered and re-packaged with a new original bonus suite!